Please allow up to 7-10 business days to process custom orders. Order will appear in Custom Job Tracker. If you place an order for a personalized product along with non-custom products, such as arcade part or merchandise, please note that all products will ship together. We ask for a minimum of 7-10 business days to process custom orders and prepare for shipping, as we often have a large queue, and personalized orders require additional processing work. If you desire to receive your non-custom products earlier, then please place two separate orders. This will allow the non-custom orders to ship within our normal 1-2 business days. This Fightstick has a 10% black tint on its control panel cover, which will affect the presentation of all printed artwork. It is recommended that you use our Photoshop template for a relatively accurate presentation, as we provide a tint layer for you to preview and adjust your artwork in advance. Link to template is below. In addition, we are unable to reproduce this Razer EVO panel in plexi due to its unique design, made by a plastic mold and curved. Because the button layout and control panel are baked into the panel, we do not offer button layout or control panel adjustment. Control panel artwork represents one of the most convenient means to personalize your fightstick, giving it a new look almost immediately. Artwork prints are developed using a top-of-the-line commercial printer, offering vivid, professional-quality artwork replication. The printer is capable of resolution of 1200dpi (dots per inch), and 6 color ink system (Cyan Magenta Yellow K(Black) + Light Cyan, Light Magenta and White) reproduces artwork over a wide color range, whether submitted as RGB or CMYK. Artwork is printed on 10 mil cardstock sheet. It carries 95% brightness and tensile strength of 100 pounds per inch. Each print is laser cut to your specifications, as presented by available options. You will receive the print with insert cutouts designed to fit your chosen brand. Gently press downward to remove the cutouts. 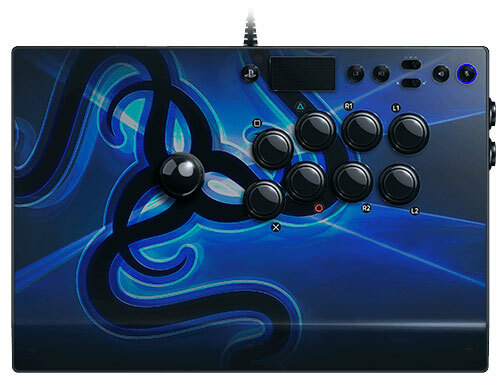 The artwork is designed to fit the Razer Panthera EVO for Playstation® 4/3. Please note that two common options - button layout and control panel removal - are not present in this service. The Razer EVO's unique control panel design does not allow for any modifications of button layout or control panel area. We also cannot create replacement plexi due to the Panthera EVO's design. This will not fit the original Razer Panthera (2016-2017 model), nor Razer Atrox for Xbox One or Xbox 360. Blank plexi, custom etch plexi and artwork for the original Panthera are available if you are looking for that model. The EVO Panel has an (approximate) 10% black tint, which will affect all artwork displayed below it. 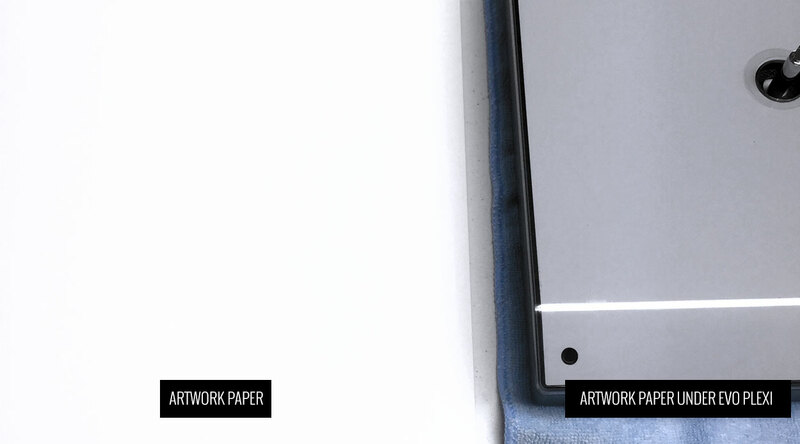 This means that the whitest point of your artwork will have a 10% darker tint once the acrylic cover is placed on top. Please keep this in mind when creating artwork for it. Our Photoshop template has a "Tint" layer that you can use to make adjustments. We cannot replicate this panel, so when servicing the unit upside down, we recommend that you place it on a soft cloth or towel as it tends to scuff easily on hard surfaces. There are six (6) Phillips head panel screws located underneath the Panthera EVO. These hold the tinted acrylic cover in place. Each one is accessed using a mini precision screwdriver. Anything larger will risk stripping the screw. Turn carefully - the screw will take a bit of effort to loosen on first go, but will give way. Once the screws are removed, find a safe place to temporarily store them as they are quite small and easy to lose. Also located on the underside of the Panthera is a rubber cap that hides the joystick shaft. Use a fingernail or flathead screwdriver to pry the cap off. Affix a flat head screwdriver to the base of the joystick shaft to keep it from spinning, and reach around to the opposite side of the Panthera to remove the balltop. You need to remove the balltop in order to lift the EVO's acrylic cover up. On the top of the panel, you will see a tiny screw located underneath the black dustwasher. With a mini precision screwdriver, unscrew and store in a safe place to avoid losing it. Next, carefully lift the EVO's acrylic cover. There are long columns underneath the cover, which represented contact points for the six small screws you removed earlier. Pulling upward, take care to lift each corner of the cover equally. If you do not intend to replace the buttons, you can now affix the new artwork, and lower the acrylic panel onto it. The cardstock artwork will bend slightly, conforming to the shape of the panel. If you do not intend to replace the pushbuttons, the process to replace artwork is complete. You can now reverse the steps to reattach the tinted acrylic cover. 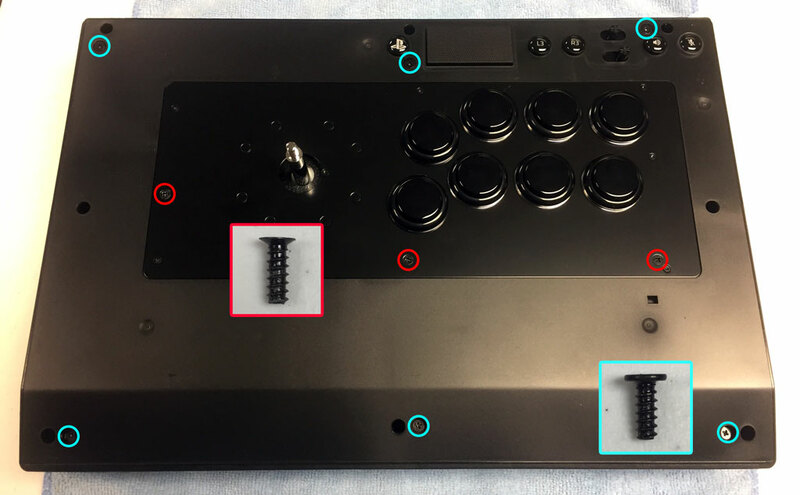 If you do intend to replace the original Razer Panthera EVO pushbuttons with Sanwa, Seimitsu, Crown, GamerFinger, or other brand of pushbutton, you will first remove nine (9) screws from the Panthera EVO enclosure, below the acrylic panel. With a Phillips head screwdriver, remove three (3) screws directly on the metal joystick and button panel. Next, remove the six (6) screws positioned above and below the metal panel. 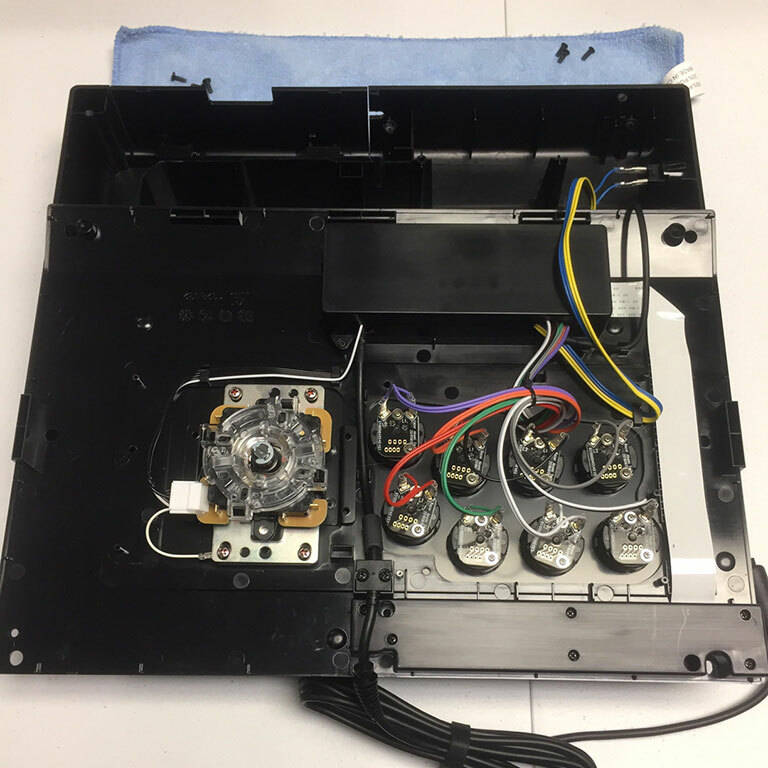 With the nine screws removed, lift and flip the EVO panel to expose the joystick and buttons. Of note, the joystick is secured with hot glue on the 5-pin connector, and red plastic glue on the mounting screws. It will take some effort to remove them. 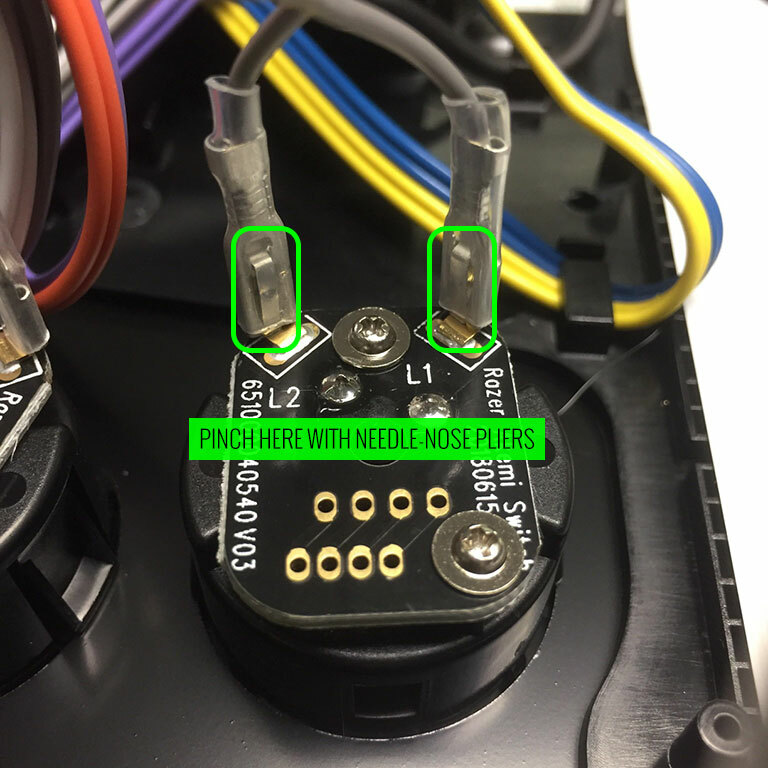 Also of note - you cannot install Korean joysticks such as the Crown 309-MJ, Seimitsu LS-32, LS-40, or Hori Hayabusa, due to a plastic column that blocks the wider mounting plate of these models. You can likely install the Seimitsu LS-5x series joystick levers, however. If you desire to install a K-stick or lever with larger mounting plate no matter what, you could potentially use a cutting tool to cut away at the plastic column. Removing the original Razer pushbuttons requires disconnecting the wires that are attached to the .110" terminals on each button. It is recommended that you do not attempt to pull with a wrench or your finger; the design of the button microswitch can easily bend and distort from the force, possibly damaging the button terminals. Instead, use needle-nose pliers to grasp the disconnects by their tabs (circled in green), then squeeze in and upward. If the tabs are pressed in correctly, the disconnect should lift with just a bit of effort. If you find much resistance, retry pinching the pliers around the tabs and squeeze again. Often, you will have several options to personalize your control panel, such as button layout, removal of control panel or screws in some models, button label etching, and text etching. Pushbutton manufacturers such as Sanwa, Seimitsu, Crown and GamerFinger have each produced specific models with a clear or translucent plastic cap and flat plunger. These are often used to display a graphical insert, allowing you to enhance the button's appearance. That said, each button manufacturer has designed the artwork cap with a different diameter than their competitors. For example, GamerFinger's artwork cap has a diameter that is slightly larger than Seimitsu or Sanwa. An insert cut for a Sanwa artwork cap will fit loosely when inserted into the GamerFinger artwork cap. This is an undesirable result that can produce a white or colored ring around the insert. Now, you can choose the button insert cut to match the pushbutton you intend to use. This allows the insert to fit snugly within the cap. In some instances, a button brand or model does not have a 24mm equivalent with art cap. In this case, we will cut to the default size of Sanwa 24mm insert. Please note that if you later intend to purchase a different button, you may need to get new button inserts or new artwork. If you are uncertain which button you may choose, Sanwa is chosen by default. When processing orders, a frequent mistake we found among new players is choosing the wrong size for action buttons, such as punch and kick. Within the fighting game genre, Japanese arcade buttons commonly consist of two diameter sizes: 24 millimeter and 30 milllimeter (mm). In most configurations, 30mm represents your action button. These are front facing, appearing most prominent on your Fightstick control panel. Option button, such as "Start", "Select", or more recently "Option", "Touch", or "Share" are usually 24mm. Below is a visual representation of a common Fightstick control panel. Throughout this article, we will mark 24mm in green, and 30mm in Orange. Another way that players can misinterpret the pushbutton size is by measuring the pushbutton plunger. Have a look at the diagram at right. The plunger - the part that you press down to represent an input - is 25mm or a bit smaller in most 30mm pushbuttons. Often this leads to the conclusion that one needs a 24mm button and not 30mm. Similarly measuring the button rim can lead to confusion, as it is intentionally larger than the button hole it is placed in. You don't want to use these measurements. Instead, review the button housing diameter, or the hole the button will be placed in. You can do this with a caliper - a digital caliper is often quite helpful for this and other arcade-related projects. Most Fightsticks from MadCatz, Hori, Qanba, and similar will use these two sizes. How the buttons are used will depend on the model joystick that you own. Over time, we'll provide example configurations for specific popular Fightstick models and arcade cabinets using the color key for 24mm (green) and 30mm (orange). We'll also expand the key for future models if another size is introduced, and we offer for sale. Click here to access and download plexiglass templates (in Photoshop PSD format) for your desired model. Important: Using templates outside of the ones we provide may produce unwanted output. We are not responsible for output generated from unsupported templates. More information here. Click the "Options" tab for a detailed explanation of each laser etch and cut options available to you. Using a mobile device? Click here to scroll to the descriptions. Custom orders cannot be returned for refund, or exchanged for another custom order. Orders damaged upon arrival are subject to special terms within our return policy. Please see our FA Plexworks FAQ for more information about our Plexworks return policy and related Q&A. If you have not used our Plexworks custom services before, we recommend that you visit our support section for updated information, helpful tips, and resources to get the best output. Learn about our Custom Job Tracker to keep tabs on your custom order while staff processes it from start to finish. Save time getting answers by visiting our FAQ. Learn more about the personalization options available to you. Hire a skilled artist from the Fightstick Artists Network to visualize your idea. Handling the artwork yourself? Review our requirements and get tips to optimize your laser etch or artwork submission. Learn about additional products and services we offer under FA Plexworks. This video explains the many options available to you when choosing custom FA Plexworks services at focusattack.com. We also cover important tips and references for properly uploading artwork when placing an order. Visit https://www.focusattack.com/customize/ to place an order for custom Fightstick artwork, a replacement acrylic top, or even laser etched design on acrylic. For additional information about FA Plexworks, download templates, and additional tips on how to submit artwork, visit our support portal http://bit.ly/fa-plexworks-support Big thanks to Naota for his pro-tier production! ** Artwork pictures are sample illustrations. All printed artwork is submitted by the user, and not sold directly on the website.